As the resident “bag geek” on staff, I get to try out all the new laptop bags we receive here at Macworld . The thing is, thatsalotta bags. I try to squeeze one or two of my favorites into each month’s “Mobile Mac” column in the magazine, but for every one of those, there are a bunch that don’t make it into print. Which is a shame, considering that “Which bag should I get?” is one of the more common questions we see in the Portables section of the Macworld forums . Thankfully, we now have the Mobile Mac Weblog; today is the first installment of a semi-regular “bag of the week” column. I’m a big fan of carrying my laptop in a backpack rather than a shoulder bag, messenger bag, or briefcase. A backpack isn’t quite as accessible, but it’s much better for your back and shoulders, especially if you’re carrying more than a few pounds around. For the past several years, STM’s Sports has been my personal backpack of choice: it’s comfortable, it’s built like a tank, it has room for more gear than you’d expect, and it has enough pockets and separate compartments to keep all my stuff organized. 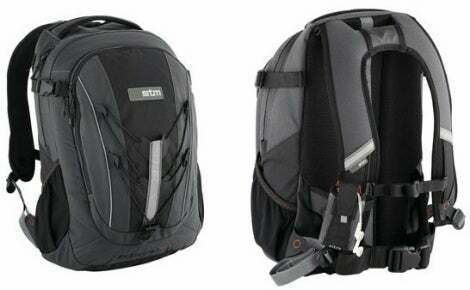 I mention the Sports because STM recently added a new backpack to the company’s line: the Evolution, available in Small ($100) and Medium ($110) sizes for the MacBook and MacBook Pro, respectively. The Evolution includes some of the best features of the Sports model, but adds a number of new features and shrinks the whole thing down into a more compact package. Waterproof zippers on the laptop compartment. A waterproof cover: if it starts to rain, just open a pocket on the bottom of the bag and pull the rain cover out and over the bag. Water-bottle/umbrella pouches: I’m amazed at how many bags still don’t include these; you get two here. Elastic straps on the outside for holding a jacket or other clothing. The Evolution looks good and, perhaps most important, is very comfortable—it’s one of the most comfortable laptop backpacks I’ve used. 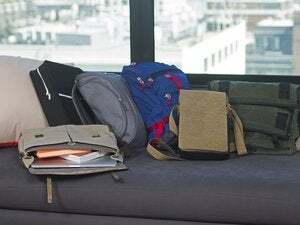 The biggest caveat with the Evolution is that it’s a compact bag; compared to some of the larger laptop backpacks out there, including my Sports, it won’t hold nearly as much gear. The larger of its two main compartments, next to your laptop, can hold a couple large textbooks. The smaller front compartment includes a well-designed organizer panel, one zippered pocket, and one open pocket/pouch; you can fit your essential laptop accessories in here, but don’t expect to bring a road warrior’s full complement of gear. On the other hand, the upside to the Evolution’s design is that if you do travel light, you’re not carrying more bag than you need—the Evolution is surprisingly small and light for a bag with this much protection and this many features. My only real complaint about the bag is that its iPod pouch is oddly placed. Instead of a dedicated pocket somewhere on the bag, the Evolution provides a removable, padded pouch that snaps into the laptop compartment of the bag; the pouch itself is well-made, but its location can result in a lump on that side of your back if you’ve got other large items in the main compartment. I ended up placing the pouch, with iPod inside, in the outer compartment. Overall, the Evolution is a great bag for someone who doesn’t need lots of storage space. And if it’s built like my Sports backpack—and after a couple months of testing, it appears to be—it should last much longer than your current laptop. Editor’s note 3/2/2007: Article updated with the correct name of the product—Evolution, not Revolution.